The brainchild of the founder of the Longaberger Company the distinctive "Basket Building" as it is known is located in Newark, Ohio, USA. The building is a 160 times replica of one of the company's signature products, the Medium Market Basket. A seven story stucco over steel structure the "Basket Building" has become an icon and attracted media attention from around the world. Constructed in the 1990's the building opened for business in December 1997. Located in Sopot, Poland at Bohaterów Monte Cassino Street the Crooked House was constructed in 2003 based off of drawings from Jan Marcin Szancer and Per Dahlberg. Additional Photos and construction details from here. 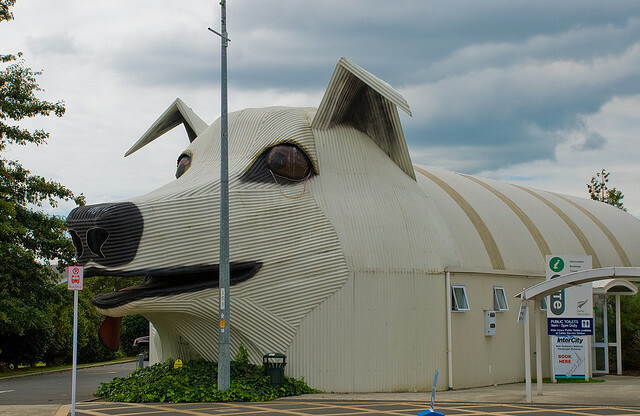 This is a building in Japan. No other info available, sorry. The owner of this house; Sim Jae-Duck was born in a washroom and he is downright proud of it. In 1999, Sim Jae-Duck launched his World Toilet Association and, to celebrate, unveiled his glass walled toilet house, which features two bedrooms, guestrooms and, of course, three luxurious state-of-the-art washrooms. 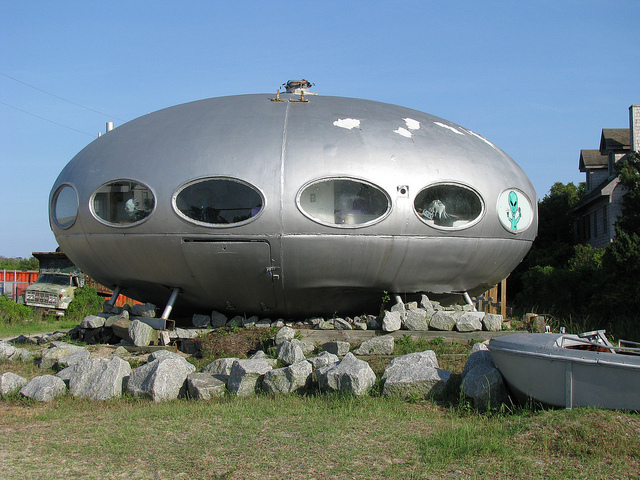 Finnish architect Matti Suuronen designed this UFO shaped dwelling in 1968, initially for use as a ski-cabin or holiday home. The idea behind the design reflects the optimism of the sixties. At the time people believed technology could solve all problems for the human race. The ideal was of a new era, a space-age, where everybody would have more leisure time to spend on holidays away from home. The Futuro house was completely furnished and could accommodate 8 people. Mammy's Cupboard dates from 1940 when it was constructed for Mr. and Mrs. Henry Gaude. 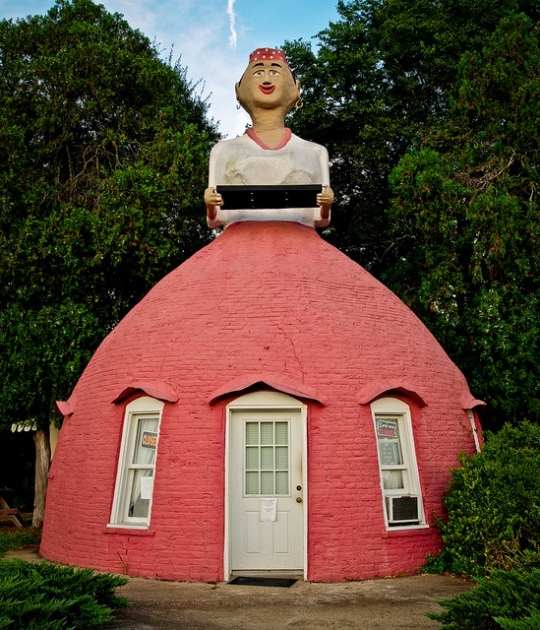 Interestingly along with now being the embodiment of political incorrectness the building is also unusual in that its architect was female; in 1940 in rural Mississippi that was definitely not the norm. Annie Davis Bost was the wife of prolific local architect and builder Robert E Bost and the couple worked together on many local projects with Annie most often working as draftsman for her husband but also on occasion acting as architect in her own right and, at least in the case of Mammy's Cupboard, making something of a "statement" in the process. Tirau is a small town [population 732, 2006 census] in the Waikato region of New Zealand's North Island and lies around 30 miles or so south of Hamilton. Traditionally a farming community the town has started to generate income as a tourist destination. The town was in decline during the late 20th century and was on its last legs by the late 1980's. A revival of sorts was initiated in 1991 by Henry Clothier, a local businessman. Tirau's location is significant in that it lies just north of the intersection of two of the major routes in the New Zealand State Highway Network [SH1 and SH5]. Clothier believed he could leverage high traffic volume in Tirau along with cheap real estate and he opened an antique shop in a former grocery store building. Over the following years other businesses followed Clothier's example and in time Tirau began to build something of a reputation for antiques and became a "destination". 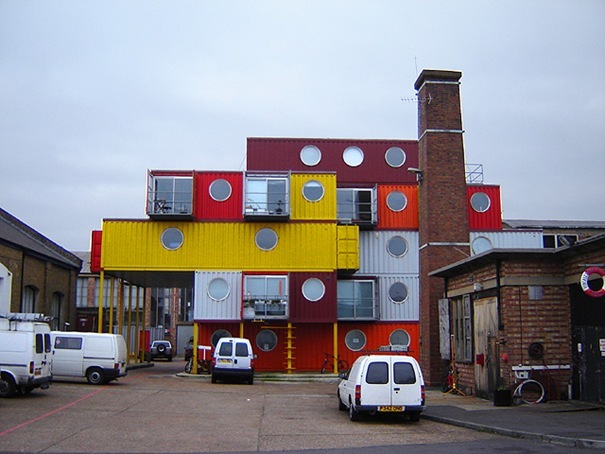 Another trend that started in the town and continues to this day is the use of old, discarded, corrugated iron to create "works of art". 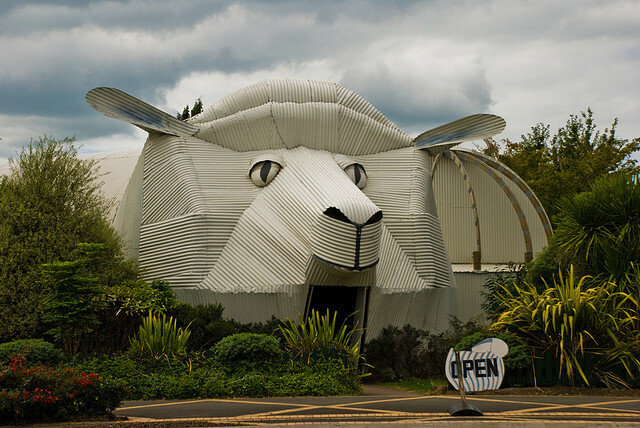 Perhaps the most significant of these are the "Sheep" and "Dog" buildings on Main Road, Tirau. 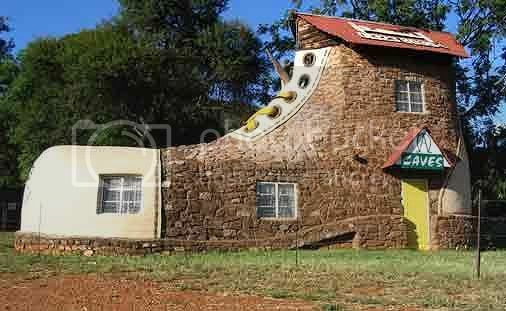 The shoe house is the work of artist and hotelier Ron Van Zyl, who built it for his wife Yvonne in 1990. The shoe houses a little museum of sorts, showcasing Van Zyls wood carvings. The shoe is part of a complex that includes an eight-chalet guest house, camp site, restaurant, pool and bar. 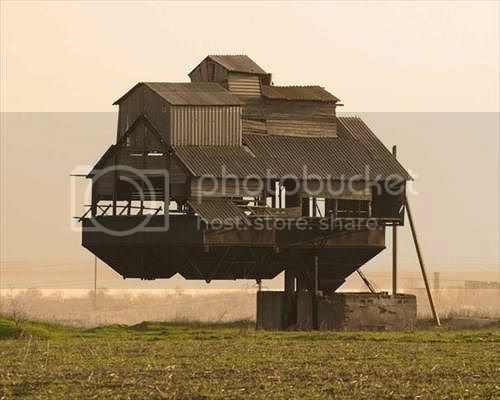 This floating house is located 1 km from Krasnosilka, Odes'ka Oblast (Ukraine). cones used for loading potatoes into trucks. Usually it looks like this. but this one looks like misplaced or partly dismantled. This is just one example of the typical dwelling used by the Korowai tribe of New Guinea, who had no idea the outside world even existed until 1970. 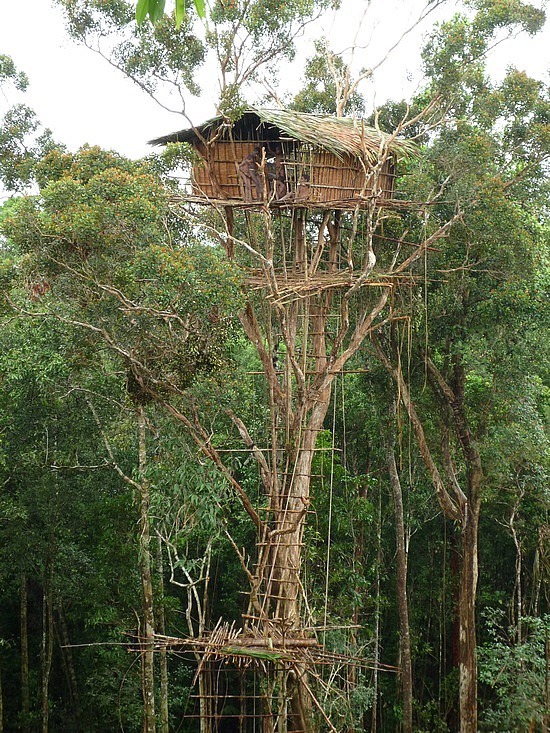 The Korowai build their tree houses up to 165 feet in the air. They do this to avoid predators, floods and ant swarms. 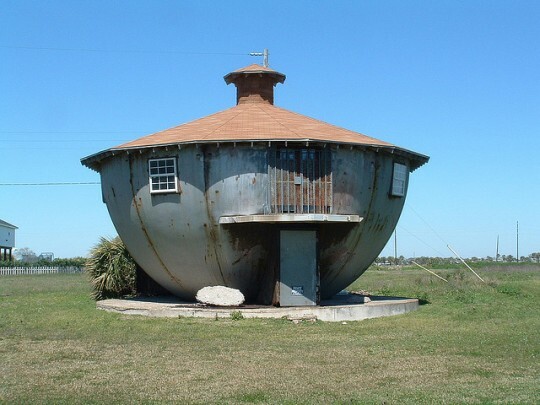 This rather peculiar metal structure is located in Galveston, Texas close to the Gulf Of Mexico shoreline. Most buildings here are on "stilts" but not his one. However despite all manner of weather including the powerful Hurricane Ike in 2009, the building has stood for some 50 years or so and stands to this day. 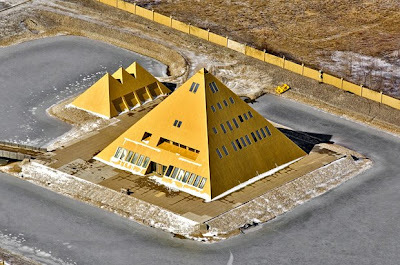 The Upside Down House is a project created by a Polish businessman and philanthropist named Daniel Czapiewski, and is located in Poland in the tiny village of Szymbark. The house is meant to be a profound statement about the Communist era and the state of the world. A little stone house in Portugal is making a lot of waves. Its not that its a house made out of stone; there are a lot of stone houses throughout Europe. Its that this home in the mountainous Fafe area isnt just little stones cobbled together; its more like a single solid stone. 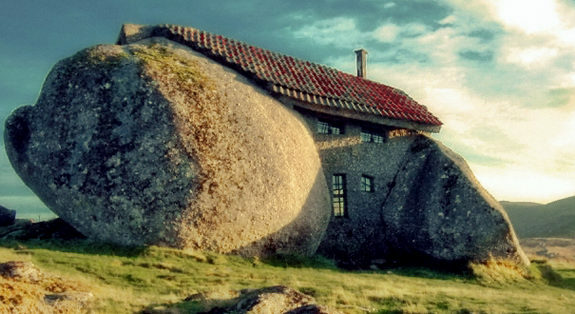 A Casa do Penedo, or The House of Stone, is carved from and built between four gigantic boulders. Originally a family retreat built in 1974, its now such a popular tourist destination that owner Vitor Rodrigues has had to reinforce the windows, put in a steel door, and eventually had to move out to find respite from the tourists. 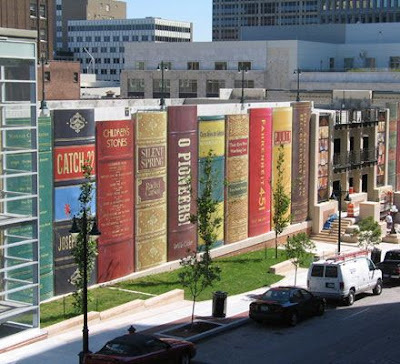 The Kansas City Public Library is a public system headquartered in the Central Library in Kansas City, Missouri. The system operates its Central Branch and neighborhood branches located in Kansas City, Independence, and Sugar Creek. Founded in 1873, it is the oldest and third largest public library system in the metropolitan Kansas City area. 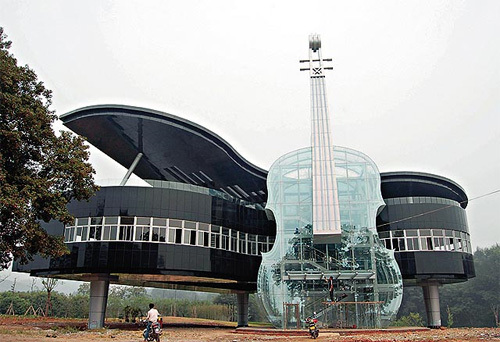 The Piano House is located in Huainan City, Anhui Province, China. The building was designed by students from the architecture department of Hefei University of Technology and developed alongside designers of Huainan Fangkai Decoration Project Co.
Hiyo ya Korowai, ukitaka kukata gogo lile la kuharish unawaje? Upepo ukiwa mwingi cjui inakuwaje hapa. An intoxicating cocktail of smells hits you as you enter Charles Lugenga's house; rubber, tarmac, oil all combine to make a whiff that you probably would not want to experience in your own house. 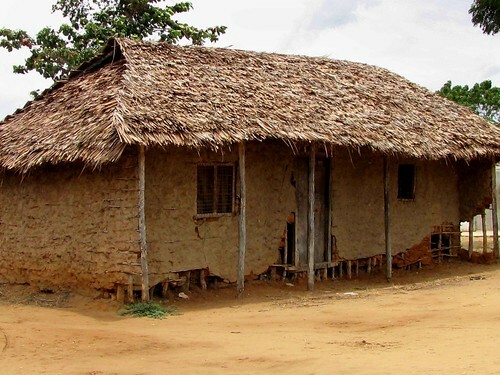 But then again Charles Lugenga's house is no ordinary house. It is made, apart from a few supporting wooden struts, exclusively out of worn-out tyres picked up off the streets of Dar es Salaam. Set among more typical breeze-block residences in a city suburb, it is a bizarre sight. Its [COLOR=#009900 !important]roof[/COLOR] is an uneven jumble of unravelled tubes. 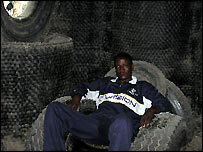 Inside, with expansive and enthusiastic gestures the proud owner shows me a single large room with a carpet woven from tyre-strips as well as a table and two comfy [COLOR=#009900 !important]chairs[/COLOR] made from tyres which once graced [COLOR=#009900 !important]cars[/COLOR], buses and agricultural machinery. A sign on [COLOR=#009900 !important]the roof[/COLOR] declares it as the "First tyre house in the world". Well, it is certainly the first of its kind in Tanzania and what is more it has a serious message. Solid industrial waste is rapidly becoming a serious problem in Tanzania and tyres are perhaps the most visible example of this. When you start looking, you see tyres and remnants of tyres discarded everywhere, blighting the landscape; by city roads, in rural fields, on beaches, well just about everywhere. It used to be different, [COLOR=#009900 !important]according to[/COLOR] Charles Lugenga. "In Tanzania, there was traditionally a culture of recycling. Worn-out tyres were snapped up and all sorts of household objects were made from them; shoes were always popular." But that all changed as a result of trade liberalisation, says Mr Lugenga. "Trade liberalisation boosted our economy. Gradually there were more [COLOR=#009900 !important]vehicles[/COLOR] on the road and more and more discarded tyres. These are the tyres which now scar our country." And it's not just the landscape the tyres are ruining. Left by the roadside, they can often cause accidents on Tanzania's busy highways. They are also perfect breeding places for mosquitoes if water collects in the rims. No-one will ever live in this house, even though once it is painted, the acrid smell will disappear, Mr Lugenga assures me. It is meant more as a symbolic statement that something needs to be done about the problem of solid industrial waste. 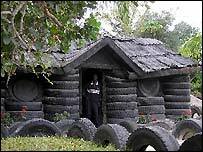 "This house shows that with imagination, tyres can be recycled effectively." EPBA is now holding workshops aimed at persuading people to make new objects out of tyres; [COLOR=#009900 !important]lamp shades[/COLOR], tables,chairs and the once ubiquitous rubber sandals. It is not clear exactly how far scavenging for used tyres in [COLOR=#009900 !important]the quest[/COLOR] for creativity and environmental friendliness will help to [COLOR=#009900 !important]clean[/COLOR] up Tanzania's blighted landscape but it can only be a good thing. And as I drive away from Charles Lugenga's unique house I can't help but admire that his sandy drive is lined on both sides with what else: Tyres.